Although wasps can help gardeners by killing pest insects and pollinating your plants and veggies, they can be a real nuisance if you enjoy eating out in your backyard during the summer. And if there’s a wasps’ nest close to your property, chances are the black and yellow peril will find their way into your home, presenting a danger to your family and curious pets. One very effective way of controlling wasps outside your home is by using wasp traps. Traps are easy-to-use, safe, and very efficient. In this Buyer’s Guide, we’ve reviewed five of the very best wasp traps that are on the market today. We’ve also included lots of handy information to help you keep wasps at bay this summer. Here are some of the best wasp traps that are available. When you’ve found the perfect wasp trap for your needs, place your order and look forward to enjoying your barbecue unmolested by the buzzing menace! The Hoont wasp trap uses light, as well as bait to attract wasps and hornets. The light is solar-powered, so you don’t have to buy batteries or plug the trap into the mains. Wasps fly into the trap through small, one-way entry holes. Once inside, the insects can’t fly out again. The reusable trap’s sturdy design means it will last for years. Solar powered light and a sweet bait make the trap doubly effective. The trap is quite small so may need cleaning more often than larger traps. The light switch corrodes over time. The Aspectek wasp trap is a top-selling product that’s perfect for use in your garden. A sugar attractant inside the pear-shaped device lures wasps, hornets, and yellow jackets into a trap from which they can’t escape. The trap is simple to set up and works very well. Although the trap is reusable, it can be difficult to clean out properly. Rescue fly tape is an old-style, effective wasp trap. You can apply the tape to any surface anywhere you need it, making it more versatile than some other devices. The adhesive tape can be applied wherever you need it. The trap is very cost-effective compared with other traps. The tape catches flies and other flying insect pests as well as wasps. You’ll need to change the tape frequently so that you don’t have dead insects on display around your home. The Rescue trap works by using its bright color to attract wasps. An adhesive substance coats all sides of the product, trapping wasps and other insects on contact. There’s a plastic guard fitted to the trap so that hummingbirds don’t get stuck. The trap is pesticide and chemical-free. The trap includes a bird guard to prevent hummingbirds from becoming caught. The design is unobtrusive when hung in your backyard. Trapped wasps remain stuck to the trap on view to your visitors until you replace the trap with a fresh one. The Sterling Rescue Trap is a basic hanging trap that contains a sweet-smelling attractant. The trap works by luring wasps and hornets inside through a small hole. The traps are disposable, and the bait is non-toxic. When the trap’s full, just throw it in the trash, wasps and all! The product comes in a pack of six, representing excellent value for money. The product is disposable, so you don’t have to handle dead insects when cleaning it out. The plastic parts of the disposable trap can’t be recycled, so it’s not very environmentally friendly. The trap looks unattractive in the garden when compared to other devices. 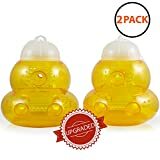 What types of wasp traps are there? There are several different forms of wasp traps on the market today, all of which are effective and have the same basic premise; they trap wasps until the insects die. Bottle traps can be homemade or shop-bought. The trap is shaped like a bottle and contains a sweet-smelling attractant to draw the wasps to the trap. The insects crawl into the trap through a small hole and are unable to find their way out again. Eventually, the trapped wasps die. Traps that use light to attract wasps and other insects are in essence the same as bottle traps. The insects are lured to the light inside the unit and are unable to get out again, eventually dying inside the trap. Some light-based traps also have an inbuilt fan to blow the insects through a narrow hole and into the trap. Sticky paper traps are the most traditional method of catching wasps and other flying pests. These traps typically don’t contain any lure and rely on the wasps bumping into the sticky paper as they fly around in search of food. Some sticky tape traps can be fixed to virtually any surface, including glass so that you can use them inside your home as well as outside. The type of trap you pick will be decided by your circumstances and where you have a wasp problem. Here are some of the most common features to consider when choosing a wasp trap. Most wasp traps don’t use harmful chemicals. However, some may catch hummingbirds too, so always make sure that the trap you choose has bird guards fitted to it. If you don’t like the idea of throwing away plastics and you don’t mind handling dead bugs, look for a trap that’s reusable. Check that the design of the trap makes it easy for the wasps to enter, but impossible for them to get out again. Often, multi-entrance traps are more effective than those with just one way in. Most wasp traps use a sweet-smelling attractant as bait, which is supplied with the trap. When you empty the unit, you can buy replacement bait, or you can make your own. If you prefer not to use bait, choose a trap that uses light or bright colors as an attractant. Light traps are often more aesthetically pleasing than bottles or bags of sticky liquid. Reusable traps are more cost-effective than single-use ones. However, you must be prepared to handle dead wasps and sticky liquid bait when cleaning out the trap and replacing the bait. If you choose a UV light trap, remember to check what powers the light. Battery powered units incur extra costs in replacement batteries. If you need to plug in the trap, you’ll be restricted as to where you can place it. Solar powered UV light traps can solve both these issues and may suit you best. So, having chosen the perfect wasp trap, you’ll need to know where to place it for best results. If the trap is for outdoor use, you’ll need to put it where there’s food. That means that if you have trash bins that are collected once every week, hang some traps around the garbage can area. During the summer months, hornets and wasps will gather around your garbage cans looking for food, and you can drastically reduce their numbers with a few efficient traps. Another popular area for wasp activity is around standing water. Wasps are drawn to water, so hanging traps around your garden pond or swimming pool can be a good way of taking out large numbers of the pests. If you like to have friends round for cook-outs in your backyard and you have a problem with wasps bothering you on your patio or decking area, DO NOT hang traps there! Now, at first that sounds contradictory, but by placing traps 20 to 30 feet away from where you and your guests are sitting, you’ll entice the pests away from you, creating a wasp-free zone. How do you clean a reusable wasp trap? If you’re considering choosing a reusable wasp trap, you may be wondering what’s involved in cleaning one out. The cleaning process is pretty straightforward. Unscrew the trap’s top and remove it. Empty the contents out into a bag, seal it, and place the bag and contents in the trash. Wash the interior of the trap with dish soap and warm water. Refill the trap with fresh attractant, replace the lid, and rehang the trap. Always wear rubber gloves to protect your hands when cleaning out the traps and be careful not to touch any wasps. You can still be stung even if the wasp is dead! Although wasp traps are an excellent way of getting rid of these summertime pests, there are some steps you can take to deter wasps from building a nest on your property in the first place. In the early spring and again in the fall, spray an insecticide product under the eaves of your home. Be sure to coat the underside of the eaves, including a portion of the siding under the eaves. This action will kill any wasps that land there, preventing a colony from being established. Look for an insecticide that contains 1-methylethoxy or Tetramethrin as an active ingredient. Get yourself a few wasp traps, like those we’ve reviewed in this Guide. Place wasp traps around your property, well away from entry points to your house. Foraging wasps will then be drawn away from areas used by you and your family and won’t be tempted to enter your home in search of food. Wasps are attracted to sweet foodstuffs, so be sure to keep fresh fruit, sugar, and candy in your refrigerator or cupboards. Try misting areas of mulch and plants around your pool or garden pond with pyrethrin. A weekly misting will deter wasps from building a nest in these areas. Pyrethrin is safe to use around people and pets. If you have wooden decking, try spraying cypermethrin underneath once a month. The odor of wood can be an attractant to certain species of wasps, and if your deck is constructed close to ground level, they may build a nest there. In this section, we answer some of your questions about wasp traps and wasps. If you don’t see the information you need, just get in touch, and we’ll try to help you out. Q: Does vinegar attract or repel wasps? A: According to the University of Wisconsin-Madison, vinegar is an effective bait for German yellow-jackets. In fact, a combination of vinegar and fermented molasses is one of the most potent attractants you can make for this relative of the wasp. Q: Are wasps dangerous to people and pets? A: Wasps do not target people and won’t attack you if you leave them alone. People and pets usually get stung when they try to catch or squash a wasp. However, wasps will attack en masse if their nest is threatened. So, always use a professional pest controller to remove a wasp or hornet nest from your property. Q: Can a dead wasp sting me? A: Yes. Wasps, hornets, and bees have venom sacs at the tail end of their abdomen. A stinger is connected to the venom sacs and injects the venom into the victim. The stinger can still be loaded with venom even after the insect is dead. Q: How many wasps are in a nest? A: An average-sized common wasp nest can produce between 11,000 and 13,000 worker wasps and between 1,000 and 2,000 queens in one season. Q: Can I make a wasp trap? A: With a few readily available items and a little know-how, you can make a DIY wasp trap. Check out this video to find out how to do it. To prevent wasps from ruining your family’s enjoyment of your outside space, treat problem areas in your yard by using wasp traps. 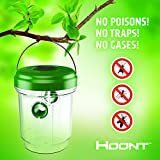 Of the wasp traps we reviewed in this Guide, our favorite is the Hoont Solar Powered Outdoor Wasp Trap. The reusable trap uses both light and bait to lure wasps, making it one of the most effective traps on the market. The light is solar-powered so you won’t need to buy batteries, and there’s no need for a mains connection. With this long-lasting, well-made trap, you can enjoy wasp-free cook-outs every summer for years to come!